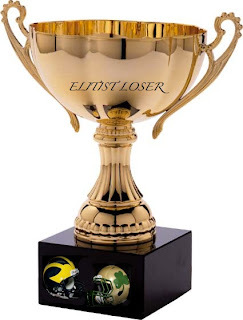 ANN ARBOR, MI - (@TheComedyNews) - After tainting both of their storied 124-year old football rivalries with multiple seasons of losing records, the University of Michigan and University of Notre Dame football teams have figured out how to spice up their match-up: a trophy. "We both always say we're the best football teams, but --- off the record---Michigan and Notre Dame football of today is really nothing more than elitist losers shrouded in pretty logos and annoying catchy fight songs," admitted Notre Dame head coach Brian Kelly. "We're not recording, are we? Okay good. Yeah, both our teams are insanely overrated," agreed Michigan head coach Brady Holke. "Coach Kelly and I went on a bar crawl on State Street in Madison, Wisconsin this summer and we talked through both of our frustrations," Holke continued. "We decided that the Michigan-Notre Dame rivalry game on September 10 of this year will be the first match-up for the new 'Elitist Loser' Trophy." ---After every incomplete pass, the announcer will remind the crowd how many National Championships the offensive team has. ---The team that is not winning will not have their score posted on the scoreboard. ---At the conclusion of every game, notable alumni of each school will participate in a wrestling match--- for the 2011 game, Tom Brady and Rudy Tomjanovich (Michigan) will fight in a tag-team match against Daniel "Rudy" Ruettiger and Paul Hornung (Notre Dame).